Since it opened in May 1889, the Eiffel Tower has been an iconic image of modern times-as much a beacon of technological progress as an enduring symbol of Paris and French culture. But as engineer Gustave Eiffel built the now-famous landmark to be the spectacular centerpiece of the 1889 World's Fair, he stirred up a storm of vitriol from Parisian tastemakers, lawsuits, and predictions of certain structural calamity. In Eiffel's Tower, Jill Jonnes, critically acclaimed author of Conquering Gotham, presents a compelling account of the tower's creation and a superb portrait of Belle Epoque France. As Eiffel held court that summer atop his one-thousand-foot tower, a remarkable host of artists and personalities-Buffalo Bill, Annie Oakley, Gauguin, Whistler, and Edison-traveled to Paris and the Exposition Universelle to mingle and make their mark. 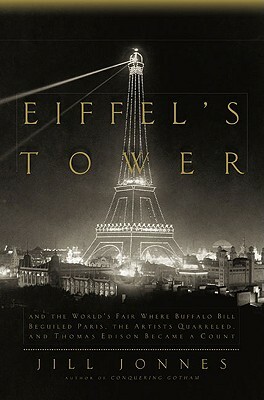 Like The Devil in the White City, Brunelleschi's Dome, and David McCullough's accounts of the building of the Panama Canal and the Brooklyn Bridge, Eiffel's Tower combines technological and social history and biography to create a richly textured portrayal of an age of aspiration, dreams, and progress.